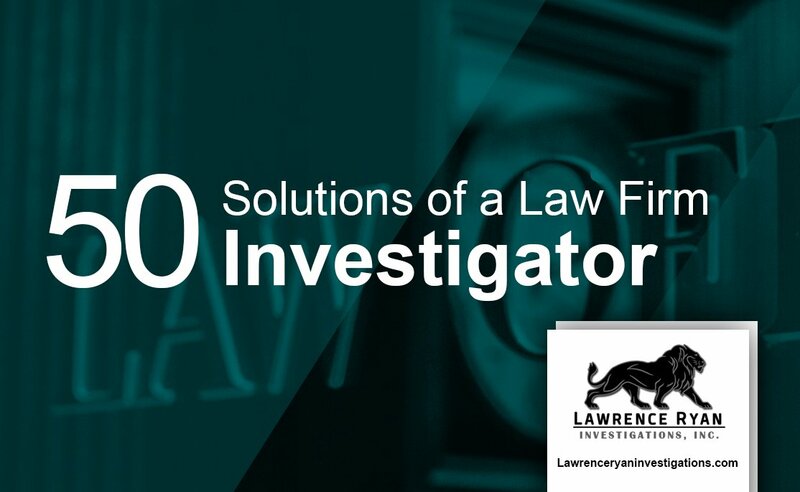 How a Law Firm Investigator can help your firm. Behind every case is a person gathering relative information that gives a lawyer a competitive advantage. Many times that person is a law firm investigator, a person not part of the police force but are licensed to conduct detective work for law firms. 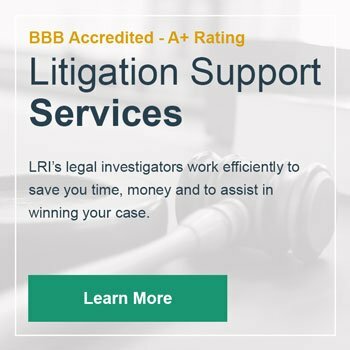 Typically a law firm will hire a private investigator firm versus having a law firm in house investigator. There can be a misconception of how a law firm investigator can assist law firms. Below are clear examples of how a law firm investigator supports law firms. 1. Find out actual details about people of interest such as date of birth, place of origin, etc. 2. Fill in the blanks about mysterious individuals under investigation. 3. Locate the whereabouts of people under investigation. 4. A lawyer private investigator can determine heirs in case of death with no heir information. 5. To bring to light missing documents such that may otherwise hinder case determination. 6. To bring up dirt, most people will want to remain hidden. 7. Research current and past market value of property in question. 8. To establish the credit worthiness during bankruptcy application. 10. To locate, retrieve and analyze criminal suits proceedings to enable the jury to make a ruling. 11. To establish criminal and arrest records of potential employees. 12. To conduct an independent analysis of a business strategy. 13. To update their client’s contact information. 14. To identify the owner or owners of property in cases of conflicts. 15. Retrieve records of corporations and other information that may be useful to a law firm. 16. Verify background information and credentials of their clients. 17. To locate and interview current or former employees or executives for a case. 18. Provide facts and knowledge to outwit opponents during a case. 19. Find about their client’s background. 20. Locate and interview witnesses or interested parties for a civil or criminal lawsuit. 21. To find hidden assets; private investigators are good at this. 22. To be involved in discreet intelligence gathering, the best bet is to hire a private investigator. 23. Establish undisclosed relationships between parties they are dealing. 24. To find out about some their clients’ dirty secrets. 25. Verify claims and statements. 26. To follow their opponents and uncover what they are doing. 27. In property tussles, law firms may hire private investigators to determine the real owners of properties such as motor vehicles, boats or aircraft. 28. Private investigators have the network, skill sets, and autonomy to do things lawyers cannot. 29. The law firm also hires private investigators to establish facts that they may need for them to take a case. 30. Law firms dealing with inheritance tussles may need to hire private investigators to help locate hidden wills, estates, and another record. 31. Private investigators are experts in finding skeletons in the closet. 32. Saves a law firms time. 33. Uncover the motivation behind any activity. 34. To vet witnesses and determine their worth. 35. To find missing people of interest. 36. Track a vehicle using GPS tracking. 37. Law firms require private investigator services in jury selection. 38. Provide surveillance of a location or person around the clock. 39. Analyze documents for potential fraud. 40. Do the dirty work for the law firm. 41. Get to the subjects using social media accounts. 43. Stay ahead of competition. 44. Private investigators help a law firm to know what their opponent is up to. 45. To investigate a suspect discreetly. 46. Offer expert advice in dealing with complex issues. 47. Provide cover to law firms to obtain relevant information. 49. Sometimes, integrate themselves in the life of a suspect or target to solve a case. 50. To have the law firms’ back all the time. Talk with a law firm investigator today to learn how they can be a critical asset to your firm. When hiring an investigator for your law firm, make sure to take the time to understand the credentials, background, and capabilities.